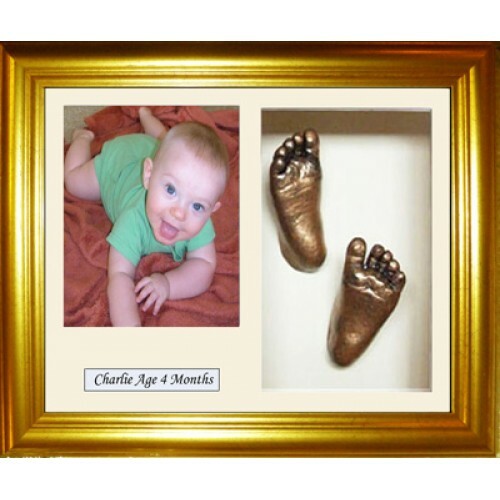 This is our stunning Gold, box-framed, complete baby casting kit with name space inclues a striking Gold box frame complete baby casting kit; the frame is a 10”x8” (254mm x 204mm) glass size, box frame, with approx. 2” (47mm) depth at the back to house your casts, so even if your baby has their hand curled up in a fist (as babies normally hold them), there will still be enough room for them to fit, you can display one or two casts in the display space, it looks fabulous either way and you can be sure that our baby casting kits include great quality materials and is one of the easiest to use baby casting kits on the market, our easy to follow instructions make creating baby casts easy for everyone to complete. The frame is glass fronted, not perspex which scratches too easily and the frame moulding has a fleck throughout it in a slightly darker shade, making it perfect to compliment any of the other paint colours we have to complete this kit, simply choose your paint colour from the drop down box, the frame comes complete with a mount and backing card in place, simply choose what colour mount & backing from the drop down box and don't forget to add which paint colour you'd like too, making this baby hand and feet cast kit exactly as you want it. There is enough material to make up to 6 baby hand or feet casts, you can create either, but we do suggest if you haven't life-cast before that you begin with casting feet and move onto hands. A complete casting kit with everything you need to create fabulously detailed 3d casts with easy to follow instructions, a perfect new baby gift. The frame has three spaces, the larger one is intended for casts and is approx. 6"x4" (152mm x 101mm), the squrer space is perfect for a photo and is 5"x4" (127mm x 101mm), and the third space is perfect for you to add a name or date detail to and fix behind the mount, this space is approx. 0.5" x 4" (12mm x 101mm), it is fabulously proportioned and will look gorgeous wherever you display it, this item helps you to create a beautiful baby keepsake. All presented in a gift box. This price is inclusive of FREE UK MAINLAND postage, all other areas we offer a small subsidised posting charge. 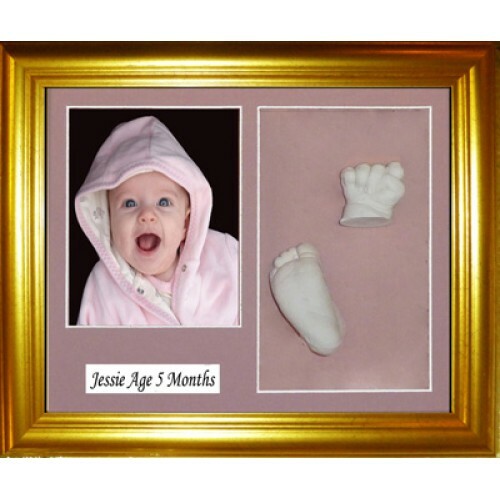 These stunningly beautiful, luxury pink deep rebate framed, complete baby casting kit this baby c.. This is our stunning, Black, wooden box-framed, complete kit with name space, a striking Black, wood.. 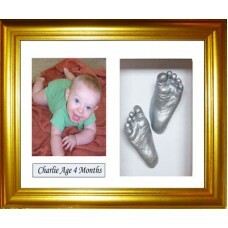 These stunningly beautifu, luxury blue deep rebate framed, complete baby casting kit this baby ca..